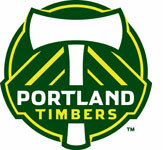 We are excited to announce that the Portland Timbers have awarded us a $5,000 grant to support Bike Camp scholarships this summer! Through the Portland Timbers Community Fund, they award grants to local nonprofits working to foster healthier kids and communities. 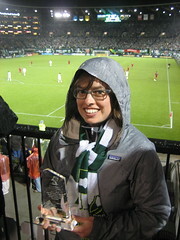 As grant recipients, we were invited to attend the Timbers vs. Real Salt Lake match on Saturday and we had a blast. Kim Whitney, our Youth Program Manager, even appeared on the Jumbo-tron as she received a plaque at half time! We had a blast while joining the Timbers Army in cheering, singing, and waving our scarves in the air. We will apply our grant towards 24 Bike Camp scholarships this summer. Bike Camp is more than just riding a bike – it’s about the empowerment and independence kids feel from a summer adventure on two wheels. Thanks to the Timbers grant, campers from low-income families will gain confidence, knowledge, and skills in a safe, creative and supportive team environment. Thank you, Timbers, for providing kids with the opportunity to have a healthy and active summer.